Charles Goadsby Ferris was born about 1796 (1792?) at the Ferris property on Throgs Neck called “the Homestead.” He became a lawyer, and an alderman in the city of New York. Most notably, he served two terms in the U.S. House of Representatives. Elected as a Jacksonian, supporter of Andrew Jackson, to fill a vacancy, he served in the 23rd Congress from December 1, 1834, to March 3, 1835. He was elected as a Democrat to the 27th Congress, serving March 4, 1841-March 3, 1843. Both terms were from New York’s Third Congressional District. Master of Arts (A.M.) degree from Columbia in 1816. He married Catherine Youngs. He died on June 4, 1848. He was the great-great-great-grandson of Jeffrey Ferris through his son, John. Ferris is credited with two legislative successes. He was instrumental in securing an appropriation from Congress to build the first telegraph line. He is also a key player in the construction of Fort Schuyler on Throgs Neck which took place from 1833 to 1856. Hon. Charles G. Ferris, Alderman of the 4th Ward, New York City, 1832-3 ; member of the 23d and 27th Congresses of the United States ; married Catharine Youngs ; they had one daughter, Caroline A. Ferris, named after his only sister, Caroline Adelia Ferris, who married Capt. John W. Richardson. This Charles introduced the late Napoleon III. to President Tyler, and the compiler’s mother has told him that she frequently dined with Napoleon at her Uncle Charles’ house on Broadway, opposite West Washington Place, recently pulled down. Morse, the inventor of telegraphy, stated at a banquet at Delmonico’s that Hon. Charles G. Ferris enabled him to make telegraphy a success by getting an appropriation from Congress for the first line between Baltimore and Washington, and without his great aid and influence telegraphy might not have been in use to this day. The erection of Fort Schuyler was due to Chas. G., as he suggested its necessity and obtained the appropriation. He died June 4, 1848. In 1801 Peter and Janet Laing bought the store and ran a grocery until the building was purchased in 1826 by Charles G. Ferris. 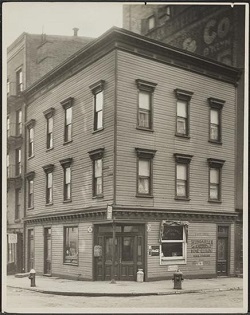 Ferris was an attorney who leased the property (directly and through his estate) to a variety of saloon and boarding house operators, until 1905 when it was purchased by Maurice Hyland. 279 Water Street has been known by many names since it was built in 1794. The property changed hands many times in the 19th century, notably to attorney Charles G. Ferris, who leased the property to a host of saloons. The most famous of these was the Hole in the Wall, owned by the aptly named One-Armed Charley Monell. Hole in the Wall was what’s known as a “pull joint.” Rather than use glasses, a thirsty patron would pay three cents to drink as much as they could in one breath from rubber tubes connected to barrels of rotgut behind the bar. One-Armed Charley also kept a glass jar full of pickling juice next to the barrels. Waterfront brawlers would return from fights and deposit their “trophies” of severed ears, fingers, and noses into the jar.